Longtime Louisiana music educator and marching percussion legend Marty Hurley passed away Monday, Sept. 12, after complications from a stroke he suffered last month. He was 65 years old. Hurley was a proponent of traditional rudimental drumming, the method of playing based on a classic system of rhythmic patterns (rudiments) that can be combined in an infinite variety of configurations and complexities to create stunning percussion accompaniments and features. An East Coast native, Hurley was a member of a number of corps including the Blessed Sacrament Golden Knights and the Hawthorne Caballeros. According to DCI Hall of Fame member Dennis DeLucia, he perfected his craft under the tutelage of legendary percussion instructor Bobby Thompson. Beginning his tenure as a drum corps staff member with several Louisiana groups in the early 1970s including the Southern Rebels, Stardusters and the Bleu Raeders, Hurley was hired in 1975 by DCI Hall of Fame member Dr. Dan Richardson to staff Phantom Regiment's drum line. He would be a fixture with the Rockford corps as percussion arranger and caption manager for nearly two decades. Richardson remembers Hurley as extremely passionate about the competitive side of the drum corps activity, though he never let that get in the way of his love of teaching and interacting with both the percussionists and with members of other sections of the corps. "Marty constantly demonstrated qualities of leadership and good will to the community and took our losses in good nature. He soothed the members when we did lose and congratulated them with great gusto when we were successful. Either way, it didn't matter to Marty, as he was there to teach the kids," Richardson said. Hurley was with the Phantom Regiment during a period of time when marching percussion was evolving. In the 1950s and '60s, DeLucia explained that the style of percussion writing was rudimental and snare drum focused because there was no front ensemble or mallet parts in the arrangements. "In the DCI-era in the late 1970s and 1980s the activity had changed. This was a time when classical corps like the Santa Clara Vanguard had shifted to a more orchestral approach in their percussion," said DeLucia. "Marty was a fierce competitor and a fierce loyalist to the techniques of Bobby Thompson. He was one who held onto his beliefs in rudimental drumming as it applied to drum corps and the whole marching arts movement." Hurley performs at the 2002 Percussive Arts Society's Historic Drummer's Heritage Concert**. "I liked that Marty was not just a great musician, but a great rudimental drummer and teacher, which he felt was the only way drums should be played," said DCI Hall of Fame member Jim Wren. Wren was Phantom Regiment's brass arranger during the time Hurley was writing the percussion parts. "He fought that battle with the avant-garde style of drumming and it probably cost the corps [competitively] here and there. But that didn't matter nearly as much as the way the kids turned out. To this day, the kids Marty taught are still part of the Regiment family." Richardson says that even after Hurley left the corps in 1993, he never lost his home with Phantom Regiment. He helped lead the organization's percussion camps for high school students up through this past spring. John Wooton first met Hurley as a student at Southeastern Louisiana University, and he played under his direction as a member of the Phantom Regiment snare line in the 1980s. He knows Hurley as an intense teacher that demanded excellence from his students. 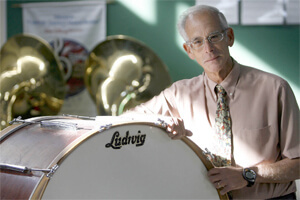 Today, Dr. Wooton is a professor of music and director of percussion studies at the University of Southern Mississippi. "Marty Hurley took no short cuts. His philosophy was to make us all around rudimental players as well as all around percussionists," Wooton said. "While some corps were looking for the easy way to do things, Marty always found the toughest." Wooton says that Hurley introduced new exercises and techniques on a regular basis. "He used to make us play entire passages starting on the left hand or play the entire show at half speed … He always pushed us to our limit and somehow knew that we would make it there." "Marty rubbed a lot of people the wrong way because he always spoke his mind. He called a spade a spade and didn't mince words. If he thought you were full of it, he told you so," says Wooton. "But the beauty of that is that no one in the line cared. Every drummer I know who was taught by Marty Hurley has a tremendous respect for him. Marty had our back and we had his." Hurley teaches fundamentals to middle school drummers at Brother Martin High School. "This is what he did, he educated and he took that very seriously," said Wooton. In addition to the thousands of drum corps students Hurley taught during the summer, he spent 37 years as director of bands at Brother Martin High School, a Catholic institution in New Orleans. The same commitment to excellence that Hurley mandated on the drum corps field was the same in his classroom. 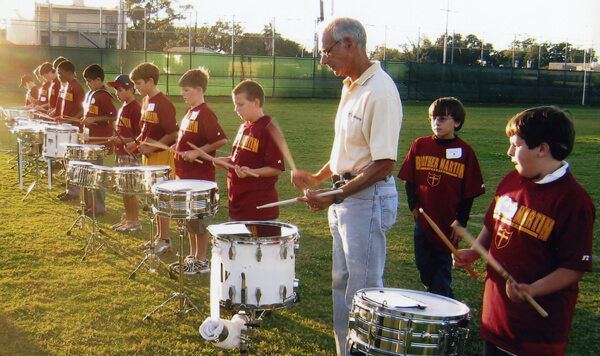 According to the Louisiana Music Educators Association Journal, during his years at Brother Martin, Hurley impressively had 77 students from his beginning percussion class eventually become All-State performers. Beyond those students Hurley taught directly, his legacy lives on among marching percussion students across the country who tackle his challenging solo literature. Titles like "Phantom Phrenzy," "Phancy Phantom," and "Phantom Phire" are a nod to his summers with the Phantom Regiment. Hurley is a 2004 World Drum Corps Hall of Fame inductee and is a 2010 inductee to the Louisiana Music Educators Association Hall of Fame. "Marty's legacy must live on, and I know it will," said Wooton. "He has influenced so many drummers and musicians that the branches of his musical heritage will live on forever." Read more about Marty Hurley: Percussive Arts Society: In Memoriam: Marty Hurley The Times-Piscayune: Longtime Brother Martin High School band director Marty Hurley dies The Times-Piscayune: Brother Martin High School band director to be inducted into music educators' Hall of Fame *Photo John McCusker, The Times-Picayune archive. **Video from the 2002 Historic Drummer's Heritage Concert DVD, available from the Percussive Arts Society. Contributing to this report: Michael Boo.